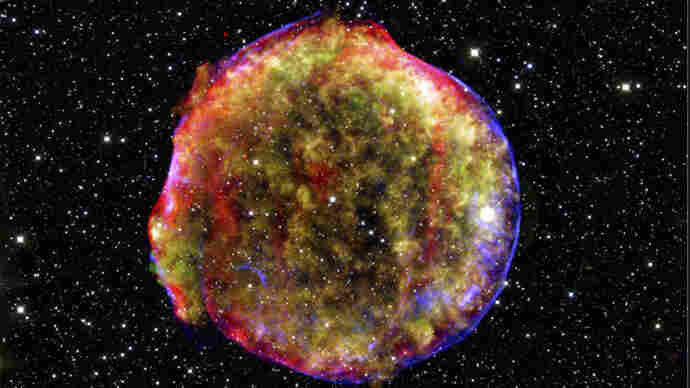 2011 Nobel Physics Prize Given For Accelerating Universe Discovery : 13.7: Cosmos And Culture Nobody expected the result. Nobody knew what to do with it. It came as a complete surprise. It sent cosmologists back to their blackboards, rethinking the structure of the universe and its history. Now the work has earned a Nobel Prize. It was one of those moments you live for as a scientist. One day you think you know what's going on. The next the world has been turned upside down. Today the Nobel Prize in Physics was awarded to scientists who discovered that the universe was accelerating. Is that worth a Nobel Prize? Yup. Here is why. As I was coming up as a graduate student, we were taught that the fate of the post-big bang universe had just a few possibilities. One was that the gravity from all the stuff in the cosmos would slow everything down enough to eventually halt the expansion and lead, one day, to a collapse and a "big crunch." In the other possibilities, gravity played a role decelerating the universe but not enough to stop expansion which would continue, essentially, forever. The idea that the expansion of the universe was actually speeding up — that it was accelerating — was not in anyone's playbook. So deceleration was the key. Everyone was looking for deceleration because, once you found it, and found how big it was, you could predict the fate of the universe. Deceleration was what the different teams of scientists were looking for when they started measuring the brightness from very, very distant supernova. Deceleration is not what they found. If the universe had been decelerating, those distant supernova would have be closer than if the universe was just coasting forever. That means the amount of light from the exploding stars should have been brighter (just as headlights from a nearby car are brighter than headlights from a distant car). But the supernovae weren't brighter, they were dimmer. That meant they were even farther away than anyone thought. This was not the result folks expected. After testing and retesting the finding, the conclusion had to be that the universe was accelerating. Its expansion has been speeding up not slowing down, sweeping objects like the supernova farther away from us in the time since the big bang. Accleration needs energy and the stunning conclusion to fall out of these observations was that the universe as a whole was full of some kind of invisible energy pushing space apart. No one knew what this dark energy was, so, in a fit of creativity, it was named "dark energy." Calculations soon showed that dark energy dominated over all other forms in the universe. Dark energy, in this sense, was the universe. Nobody ordered this. Nobody expected it. Nobody knew what to do with it. It came as a complete surprise. It sent cosmologists back to their blackboards rethinking the structure of the Universe and its history. It was the first shot in a revolution that is still underway. You can keep up with more of what commentator Adam Frank is thinking on Facebook and Twitter. His new book is About Time: Cosmology and Culture at the Twilight of the Big Bang.